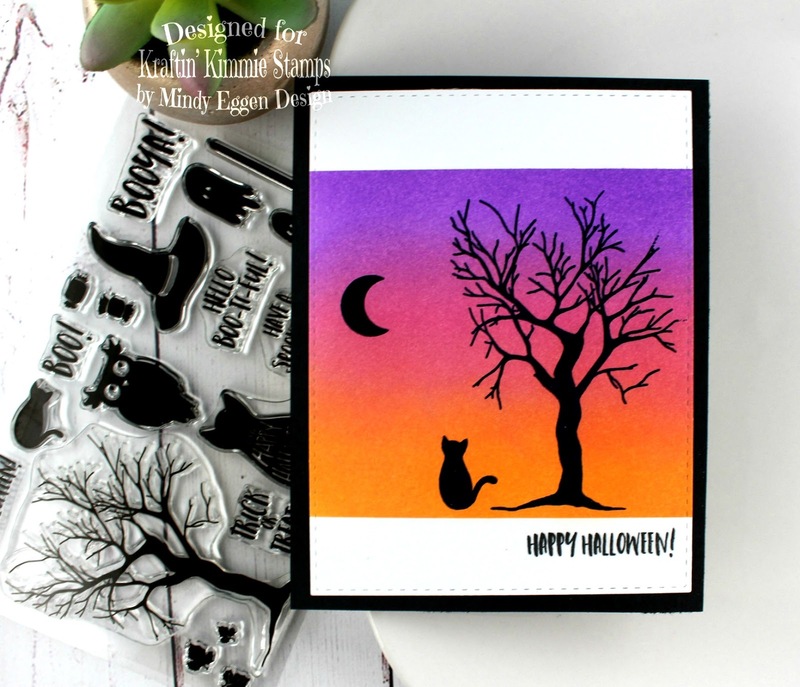 Spooky Silhouettes – Krafty Peeks Day 4 ! We are back with the SECOND new set from artist Melissa Baker-Nguyen for our Fall and Halloween release! This one is called…..SPOOKY SILHOUETTES! This totally BOO-tiful set by artist Melissa Baker-Nguyen is absolutely amazing! It features lots of halloweenie solid images which are PERFECT for using with our brand NEW Hybrid INKS!!! Especially the new trio of colours: Pumpkin Patch, Purple Petunia and Mossy Meadow! 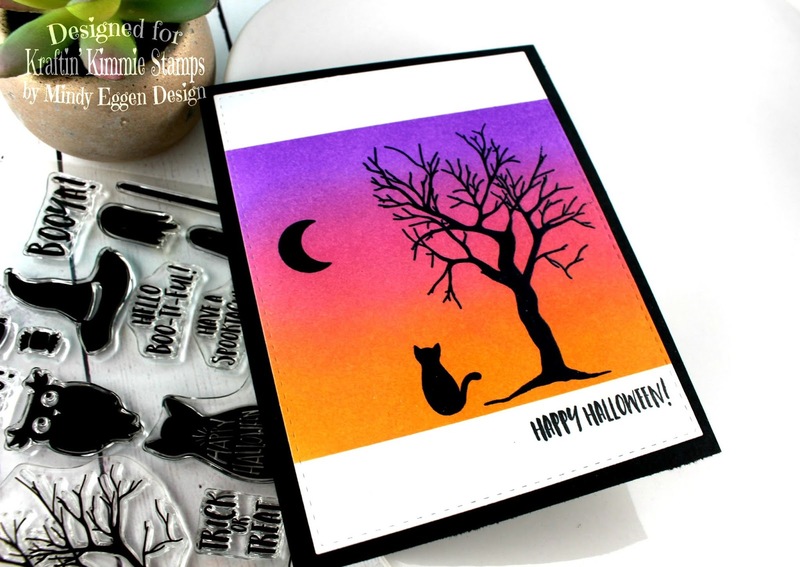 There is an awesome spooky tree silhouette, lots of solid image stamps and six fabulous coordinating sentiments! This set is wicked awesome! Just think of all the spooky scenes you can create with it! I stamped the three images in Clear Ink and heat embossed with Black embossing powder. Then I masked off the top and bottom portion of the card. I ink blended Wilted Violet, Picked Raspberry and Carved Pumpkin Distress Oxide ink. I wiped away any excess ink that was on top of the embossing powder to make the black really pop off the card. Next, I diecut my piece down with a Stitched Rectangle die and adhered to an A2 size made from Black cardstock. The sentiment is stamped at the bottom using some Wicked Black Ink from Kraftin Kimmie Stamps. How fitting! Check out this versatile set in action as you hop around the Krafty blogs today! 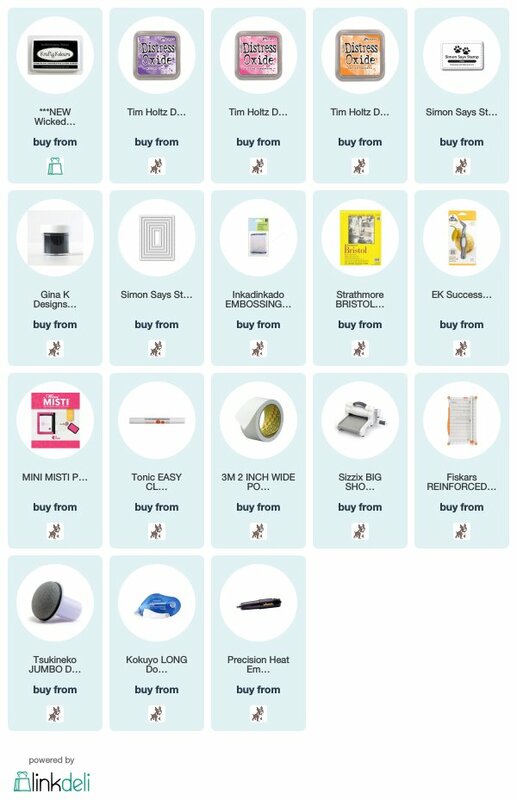 You’ll see the list of Krafty design team members below and be sure to leave some love at each stop because one lucky commenter is going to WIN a gift voucher to the krafty shop! Plus we’re doing a GIVEAWAY of the ENTIRE release on the Krafty Friends facebook page! You’ll get to see all the incredible creations for AUGUST as we share them each day this week! Be sure to join us at the LIVE Online Release Party on Saturday afternoon at 1pm EST! We’ll be checking out all FIVE new clear stamp sets, two rubber rereleases, a trio of new INKS, we’ll be sharing fabulous creations, giving away prizes and having tons of krafty fun! Happy hoppin’ and we’ll see you back here tomorrow! Grateful Pumpkins- Krafty Peeks Day 3! Gorgeous card! I love the ink colors and stamps! That’s a wonderful card !! The colours are stunning ! Fabulous card! 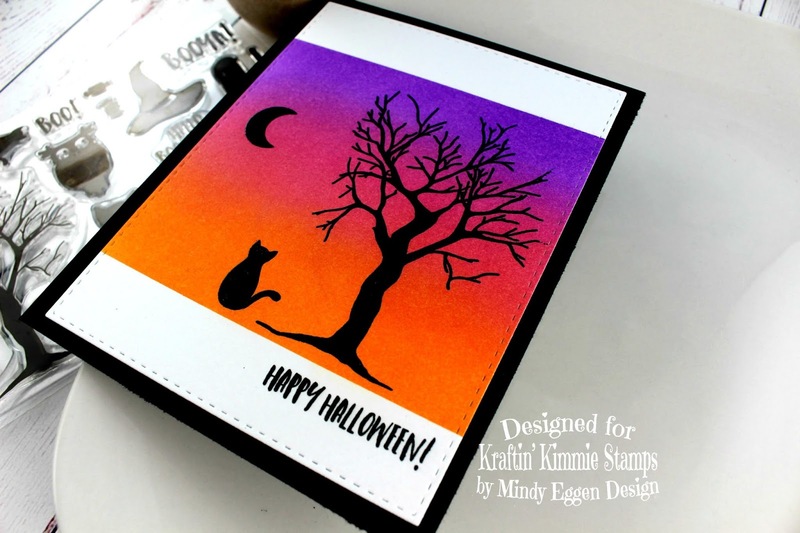 Love the background colors and the Spooky Silhouettes set! I love the vibrant background. Great with the silhouettes. Love the background, it really makes the stamps stand out!! very very nice I love how you do your backgrounds!!!! I love how vivid the colors are you used! Great background! Clean and sweet! Love your design!! Super duper cute card with the gradient background. Love it! What a great CAS card ! Mindy I love your card beautiful colors! !